Time for Theresa May to lose her Brexit cloak? "Operate within and trade with the single market." I, for one, will not be sad to see the back of some of the stock phrases Theresa May and her ministers have been using to describe life outside the European Union. Number 10 decided long ago the prime minister would give as little away as possible before the official process began. It didn't make sense to give the game away to the other countries the UK will be facing across the negotiating table. It has also, to use a diplomatic phrase, taken some time for the government to come to an agreement on what its plan would look like. There have been briefing papers aplenty, endless cabinet committee discussions, consultations with more than 50 different sectors of the business world before tomorrow's speech. The less diplomatic way of looking at it is that, as some ministers have privately admitted, there hasn't been a plan. And the spectrum of opinion in the government has been extremely wide, from ministers I've spoken to who believed that we could stay in the single market, to those who have been pushing hard for months for a rapid, wholesale departure. Essentially, ministers have taken more than six months to work out what they really want to do. And part of the problem has been that they don't all agree. Now, as one of those on the Eurosceptic side of the argument describes it, the prime minister is about to make her speech and "people like me will not be upset with it". Image caption Has Henry Kissinger provided a way through Brexit difficulties? But it is not the case that Mrs May has suddenly clicked her fingers and made up her mind about everything. Indeed, while she has been accused of dithering and delaying, lacking vision and the ability to make swift decisions, those who defend the prime minister suggest that something else has been going on - it's not just that she has been taking a long time doing her homework. Arguably, she has followed a decades-old political technique of "constructive ambiguity". The phrase, coined by Henry Kissinger, the controversial architect of modern US diplomacy, had something rather different in mind when he developed its use. "Constructive ambiguity" is based on the belief that warring parties can all sign up to woolly-sounding statements without losing out, so that a diplomatic process can continue. Whether in the Middle East or in Northern Ireland, the principle is that it's best to keep people at the table, and keep them talking, even if what seems to be actually being agreed could be written on the back of a fag packet and interpreted in different ways. By being vague on detail, Mrs May has allowed others to have the public arguments about what leaving the European Union should look like. She has deferred or defused big fights with her party, the public and the press by saying, again and again, she is ruling nothing in and ruling nothing out. It's hard for political opponents to criticise her decisions if she can keep saying that none have been reached. While this ambiguity has reigned, behind closed doors ministers have been trying to work out what is legally and politically possible, and what is actually desirable. Tomorrow we will hear some of the fruits of their labour, although not surprisingly, not every issue is resolved. But alongside the Brexit-related platitudes, whatever cross Remainers say, two big fundamental decisions were in fact made months ago, that Mrs May has not hidden. First, even in the speech before she became the Tory leader in July, she was abundantly clear that free movement of people - the existing EU system of immigration that does not put limits on the number of EU citizens who can come here - could not last. And time and again, in almost every speech she has given, and on many of the appearances that she has made at the Despatch Box, she has made it plain that, for her, controlling immigration is the priority, even it comes ahead of the economy. 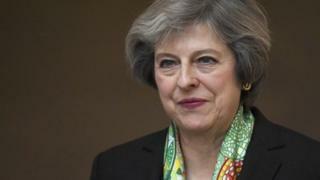 Second, again on the conference platform, in speeches and in the Commons, the prime minister has said the UK will no longer be subject to the European Court of Justice (ECJ). Those statements aren't just important in their own right, but crucial because, by implication, they mean that we will not seek to preserve our existing membership of the single market. EU countries have made it plain the UK can't have existing trade arrangements without accepting free movement of people. The ECJ is the referee of the single market too. So if, explicitly, the UK doesn't accept the authority of the referee, it cannot stay in the game. With the cloak of constructive ambiguity, refusing to spell that out, the prime minister has been able to dismiss fears about that reality as speculation, as no final decisions have been made. But as she prepares for one of the most important speeches of her life, she'll be all too aware, that protection can't last for good.